Laurie Nehring, president of People of Ayer Concerned about the Environment, at her home in Ayer. AYER — Three years ago, after federal authorities began sounding alarms about a host of human-made chemicals found in drinking water near military bases, town wells near Fort Devens tested positive for the toxic substances, some significantly in excess of what public health officials consider safe. Town officials, who had asked for the tests, tried to dilute the toxins by mixing in water from wells with lower concentrations of the chemicals. But it wasn’t until last year that they shut down the most contaminated well, the source of a million gallons of drinking water a day. It took another month before they alerted the town’s 7,600 residents to the potential threat of the per- and polyfluoroalkyl chemicals, known as PFAS, which have been linked to kidney cancer, low-infant birth weights, and a range of diseases. Amid growing calls for tighter curbs on the largely unregulated chemicals, officials at the Environmental Protection Agency recently promised to set safety standards, while some states have already enacted limits. Testing of nearly 2,700 groundwater wells on or around military installations in recent years has found that 60 percent contained high levels of the chemicals, according to the Department of Defense. Many were probably contaminated by a special firefighting foam used for years by the military. But PFAS, called “forever chemicals” because they never fully degrade, have been found far beyond military bases. The chemicals were developed in the 1940s and have since been used in products such as flame retardants, nonstick pans, pizza boxes, clothing, and furniture. In Massachusetts, the chemicals have been found in the drinking water of seven municipalities. In four — Ayer, Barnstable, Mashpee, and Westfield — they have been found in concentrations that exceed what the EPA considers safe. The chemicals were also found in Danvers, Harvard, and Hudson. But more than half of the state’s municipalities have not had their drinking water tested for the chemicals, according to data from the Department of Environmental Protection. Many more private wells have also yet to be sampled. The lack of oversight has led environmental advocates to accuse federal and state officials of acting too slowly to address the risks. 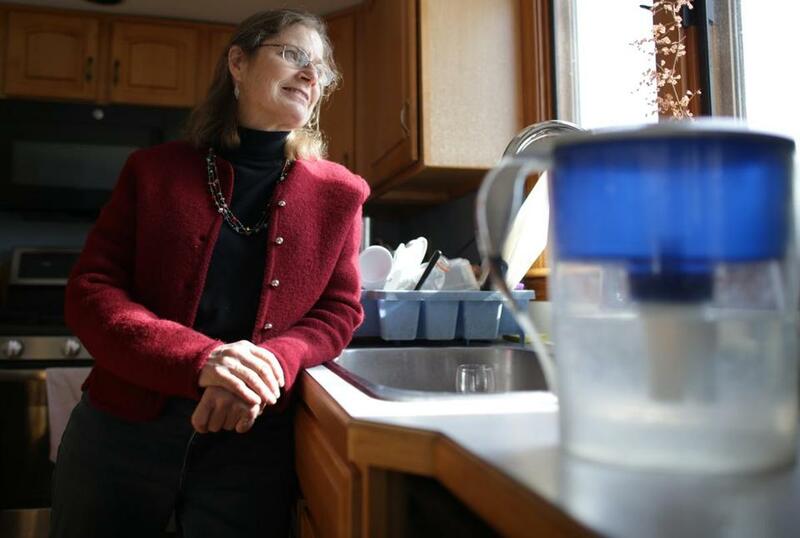 She and other advocates have urged Massachusetts and other states to adopt standards that protect residents from exposure to the chemicals and install technology to filter them out of public water systems. State environmental officials recently launched a review to determine standards for the chemicals in drinking water, as well as what PFAS compounds — there are thousands — such limits should apply to. They’re also considering standards for cleaning up polluted soil and groundwater. The state has also started a program to collect and dispose of stockpiles of old PFAS-containing firefighting foam. So far, it has collected nearly 150,000 pounds of the toxic foam from fire departments. The DEP already requires that new public water supplies be tested for six PFAS chemicals before they’re connected to residents’ homes, and they’re surveying the 181 state-permitted bottled water companies to determine if they’re sampling for the chemicals. Just three have reported that they’re testing. For now, the department advises pregnant women, nursing mothers, infants, and other potentially vulnerable people to avoid drinking water where five of the more common chemicals are found in higher concentrations. “The department is committed to ensuring residents have access to safe and clean drinking water, and looks forward to working with stakeholders to develop additional standards,” said Ed Coletta, a spokesman for the agency. In February, EPA officials said that by the end of the year they would release “comprehensive” national drinking-water limits for two of the most prevalent PFAS chemicals. They also promised additional research, monitoring, and cleanup efforts. The agency now maintains only a health advisory that recommends municipalities alert the public if the two chemicals reach 70 parts per trillion, the same level used in Massachusetts. One part per trillion is about as much as a grain of sand in an Olympic-size swimming pool. Recent studies suggest that the maximum levels allowed in drinking water should be far lower than the current advisory. One draft report by the federal Department of Health and Human Services — which the EPA last year sought to prevent from being published — found that the chemicals could be harmful at one-sixth the levels the agency now considers safe. Other states have already set stricter standards. New Jersey recently set a limit of 13 parts per trillion for one of the more prevalent chemicals, and officials there are considering a similar standard for other compounds. Vermont has advised vulnerable residents to avoid drinking water if the concentrations of five of the chemicals reach 20 parts per trillion. Some recent studies have suggested even lower limits. In response, the Boston-based Conservation Law Foundation recently filed petitions with environmental agencies in every New England state, pressing regulators to adopt strict drinking water standards for the chemicals. PFAS have been found in groundwater from Greenwich, Conn., to Bennington County, Vt. In Ayer, residents and officials are looking for more than guidance. For years now, they’ve been urging the Defense Department to help eliminate the chemicals in their water. Laurie Nehring, president of People of Ayer Concerned about the Environment, said she hoped the military finance a new $4.2 million treatment plant to filter the chemicals. Officials overseeing the former Army base declined to answer questions. But town and EPA officials said they had reached an oral agreement with the military to pay for the new plant. With hundreds of thousands of gallons of polluted water flowing every day into a local pond, and the town’s main well still offline, Wetzel wants to formalize the agreement soon. “I could wait two weeks but not two months,” he said. Construction on the plant is scheduled to start this summer. As more towns test their water for PFAS, Wetzel worries that it could create a crisis if others also discover the chemicals in their wells, leading to water shortages and wariness about public drinking water. “I’ve been in this business for years, and what’s most surprising about this is how vulnerable our water supply is,” he said.